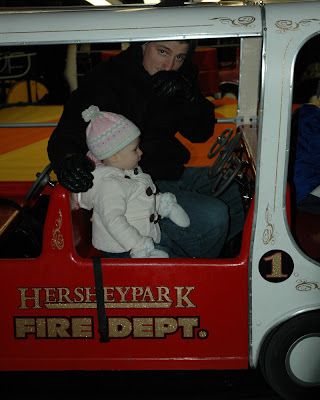 While we were visiting Larry's family in Pennsylvania, we took Ava to Candy Lane at Hershey Park. 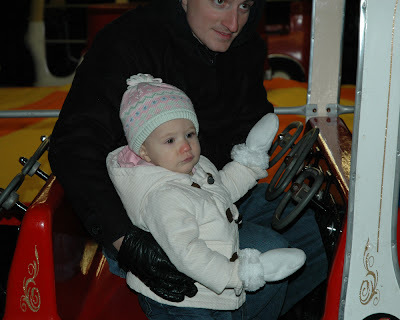 Although it was extremely cold, Ava enjoyed the music and rides. 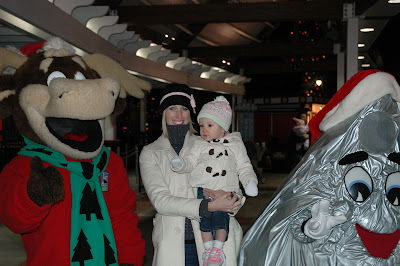 However, her favorite part seemed to be looking at all the Christmas lights. 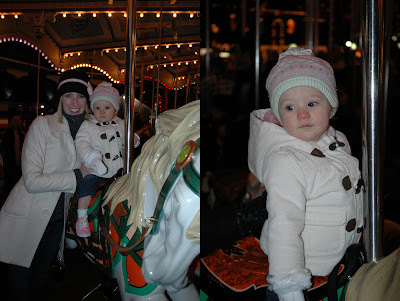 First, Krista took Ava on the merry-go-round. Next Larry took her on the kiddy cars. Ava picked the fire truck. Her favorite part was pushing the button to beep the horn. Here Ava and Krista are posing with some Hershey friends. The guy on the right is obviously a Hershey's Kiss. We're still not sure what the connection is between the moose and Hershey's chocolate. Several rides later, we decided to take refuge from the cold inside the Hershey's Chocolate Factory at Chocolate World. Here we are reprising our spring picture in front of the flying Reece's Pieces. 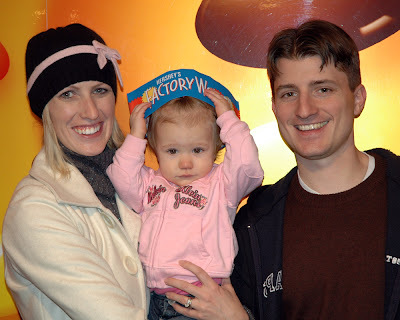 However, by this point Ava was getting tired of wearing her Hershey's Factory Worker hat. So, we took her home and put her to sleep. That'll teach her. She is just too cute...and I love all her accessories...your's too Krista!! You guys are all just so cute together!!! She has gotten so big though!!! What a fun vacation! I love all of your pictures. I love Ava's little red nose. She is too cute!